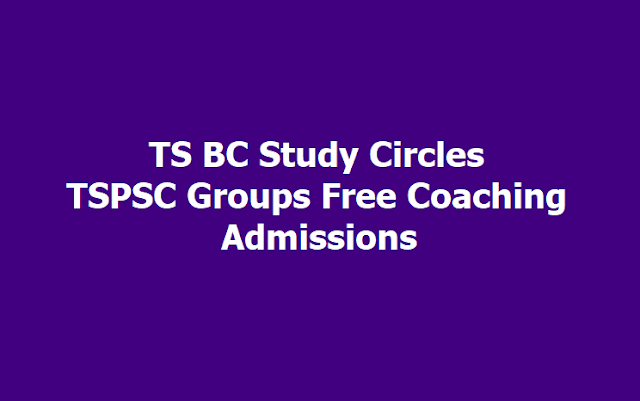 TS BC Study Circles TSPSC Groups I, II, III Exams Free Coaching 2019, TSPSC Groups Free Coaching at TS BC Study Circles, Groups Free Coaching Admissions at TS BC Study Circles 2019, TS BC Study Circles Groups Free Coaching Entrance Exam 2019: Government Of Telangana Backward Classes Welfare Department has given the Notification for Admissions in to TS BC Study Circles for free coaching to Telangana State Public Service Commission Group - I to Group - IV Services 2019. Applications are invited from eligible candidates belonging to Backward Classes (BCs), Scheduled Castes (SCs) and Scheduled Tribes (STs) for Common Screening Test for free coaching for Group -I, Group-II, Group III Services Examinations to be conducted by the Telangana Service Public Commission. The Duration of coaching is 90 days or up to the date of exam of either Group-I (Prelims) & Group-II written (Objective Type), conducted by TSPSC, whichever is less. (The Dept. may modify the duration as per schedule of the exam conducted by TSPSC. 1. The candidates shall posses the qualifications which are mentioned in the Notification issued by T.S. Public Service Commission (TSPSC). 2. The candidate’s family income shall not exceed Rs. 1.00 Lakh per annum. 3. No person who is already working in any post in any cadre is eligible for this training. 4. The candidates who have already availed the coaching programme from this institute are not eligible for the present coaching programme. 1. The selection process of the candidates for the coaching programme is based on the Marks Obtained in the Online Screening Test, and preference given by the Candidate (i.e., for Gr.-I & Gr.-II coaching) in the Online Registration form and Reservation Percentage. BCs - 66%, SCs - 20% & STs - 14%. 3. If the Marks being the same, unrepresented BC Community candidates, Woman Candidates and Physically Handicapped Candidates are preferred in the same order. 4. The Department has a right to modify the duration and other guidelines or norms at any time as per the circumstances. Free coaching will be provided to the selected candidates in T.S. Study Circles for BCs, in their Native Districts only @ 100 No’s per BC Study Circle. Apart from free Coaching, Study Material and Stipend will be provided. A combined coaching for TSPSC Group-I (Prelims) & Group-II written (objective type) Exam will be provided for the selected candidates, from 13-10-2019. Further, the candidates were provided free coaching TSPSC Group-III & Group-IV candidates, on the Marks obtained in the Online Screening Test, preference of exam given by the candidate at time of registration, as and when notification will be released by the Telangana State Public Service Commission (TSPSC). The candidates shall register through online only in the website at tsbcstudycircles.cgg.gov.in from 02-02-2019 onwards. The relevant certificates i.e., Certificates must be uploaded online by the Candidate at the time of Registration. 7) Applicant Photograph. should be scanned and uploaded by the candidate. The venue for Common Online Screening Test will be intimated to the candidates in due course of time. For further details and Registration Guidelines, the Candidates are advised to visit the Website: http://tsbcstudycircles.cgg.gov.in. The Candidate may contact to their Respective District Study Circles. 5. Commencement of Classes/free Coaching for combined TSPSC Group-I, Group-II and Group-III..
Meeku message roopamlo me cell ki vastayee..
please give me information for hall tickets. Link provided above for Downloading of Hall Tickets..
good morning sir free coaching results a time lo release chestaru sir? Sir .. selected candats ala telustadi sir nd when .. Selected candidates ki SMS Vasthundi..
what will be the exam pattern of online screening test?